I have heard this definition of Integrity: it is when you do the right thing, even if no one is looking. Yes. Right-living, or righteousness, is Integrity. Integrity also means strength, sturdiness, stability. Right-living leads to stability. Integrity builds Integrity. God is consistent like that. Speaking of being consistent, today we look at another meaning of Integrity; it is the state of being whole and undivided. Walking in truth, being who we say we are, creates a feeling of wholeness, of Integrity. You see many people today fighting for Integrity. This is why freedom of expression, being true to yourself, is held in such high esteem in our culture. Everyone is seeking Integrity; people crave wholeness. The popular idea is this: being Authentic is about letting the world see who you really are…that your lifestyle, or any lifestyle, is acceptable, as long as you are being true to your feelings. There is a tiny grain of truth in this; we should not live a double life, this is can be very damaging to us, both emotionally and spiritually. But the lie is that you can find any wholeness, or have true Authenticity without obedience to God. When we seek to find an alternative route to a life of Integrity, we are Living a Lie. For we do not have a High Priest who is unable to sympathize with our weaknesses, but One who in every respect has been tempted as we are, yet without sin (Hebrews 4:15). 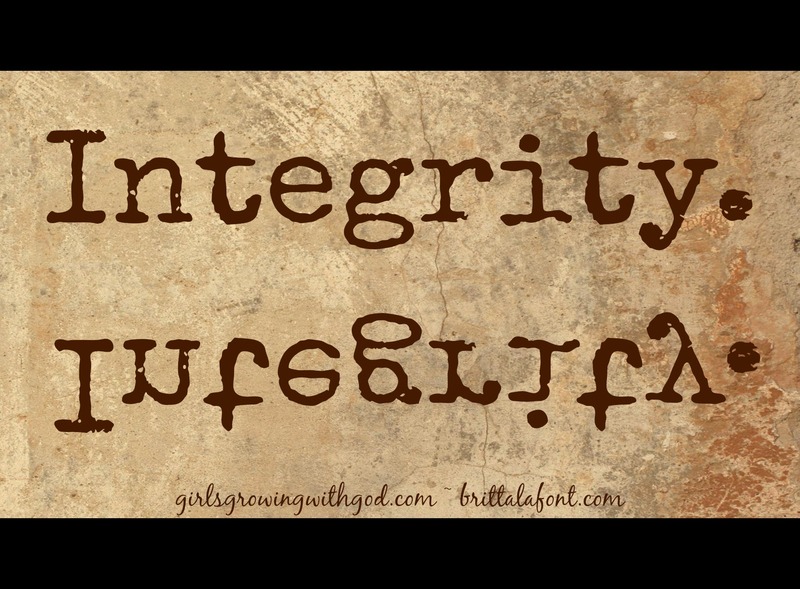 Being made the righteousness of God…this is having Integrity. Only in Jesus, can we have Integrity. I am the vine; you are the branches. Whoever abides in me and I in him, he it is that bears much fruit, for apart from me you can do nothing (John 15:5). We were made for close fellowship with God, so when our intimacy with God is broken by sin, we feel restless and fragile. Being disconnected from God, leaves us feeling fractured. We all sin. Having Integrity means that we keep short accounts, that we do not linger in our sin. If we confess our sins, He is faithful and just to forgive us our sins and to cleanse us from all unrighteousness (1 John 1:9). Confessing our sin is speaking the Truth and walking in Integrity. If we say we have no sin, we deceive ourselves, and the truth is not in us. If we say we have not sinned, we make Him a liar, and His word is not in us. (1 John 1:8, 10). And notice what happens when we confess our sin: If we confess our sins, He is faithful and just to forgive us our sins and to cleanse us from all unrighteousness (1 John 1:9). See God’s goodness there? Not only will He forgive, but He will cleanse. He will do for us what we cannot do on our own. He will create in us a pure heart and renew a right spirit within us (Ps 51:10). Isn’t God wonderful and generous? A heart that seeks after God, and not after its own way, will confess its sin and be cleansed. Confession means we are free to repent, which means to turn and go the other way, to turn away from sin and start down another path. The unrepentant heart rebels against God’s Authority, it seeks its own desires above His. Everyone likes to go their own way these days, to make their own rules, and this can distract us from the Truth. In God there is no alternative. Jesus never departed from God’s will. He never sinned. He fulfilled (means demonstrated the proper way of living) the Law and the Prophets (this refers to the Scriptures we call the Old Testament). He warned against relaxing commandments. Read Matthew 5:17-20. Jesus said: Whoever is not with me is against me, and whoever does not gather with me scatters (Matthew 12:30). The Message paraphrases this verse in this way: This is war, and there is no neutral ground. If you’re not on my side, you’re the enemy; if you’re not helping, you’re making things worse. The way of operating where we think we can ignore God’s Way and still be at peace with Him, this is living a lie. Christian, there is another way to live a lie. We need to look a little closer to home. We need to go ahead and retrieve the logs that are in our own eyes. We need to see what He grieves Him when He looks at our hearts. Being Authentic means the words of our mouths and the meditations of our hearts are acceptable to Him (Psalm 19:14). Being Authentic means we live what we believe, at home, at work, at play. We can only do this with God’s help. More on this next time! Love this blog post. But I have a question, what do you do when your struggling with rebellion against God? Do you just simply ask God to give us godly repentance that leads to life, and not worldly repentance that leads to death? I think that we are in rebellion when we can’t, or don’t want to, acknowledge when we are wrong and God is right. We might resent having to do what is right and come up with excuses to go another way. Rebellion is opposing God’s way, whereas sinning and repenting acknowledges that God is right. God’s Word is a seed planted deeply in the soil of our hearts…it takes time to grow and emerge from the dirt, and even longer to produce fruit. A big part of the process of growing is the regular repenting when we have sinned…God uses our sin to teach us about Him—His holiness compared to ours, His goodness to forgive us, and to demonstrate how being humble draws us nearer to Him. Nothing is wasted in our sinning if we repent…because God can create life out of death, make good out of bad, and bring knowledge out of our foolishness… all of this is a testimony of His greatness (it is not primarily about our poverty of spirit, but the richness of His grace).